Looking for an affordable RV that promises comfort and quality wherever you go? Look no further than our inventory here at Wilkins. 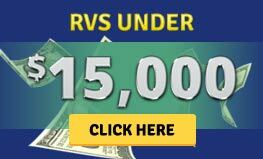 We’ve got a huge selection of RVs under 15k. Check out our selection, then get in touch with our experienced team to learn more. This attractive fifth wheel sleeps between five and six people, making it a great choice for small and medium sized families. It features a slide out for increased living space, along with a manual awning outside that allows you to create an outside living space when parked. The spacious booth dinette means the entire family can enjoy a meal together, while stabilizer jacks promise secure footing in a variety of terrain. This 25′ travel trailer sleeps four people, making it a great choice for couples and small families. At the front of the RV you’ll find a plush queen sized bed that promises a great night’s rest, while the large kitchen is equipped with a double sink, three burner range and overhead cabinets. 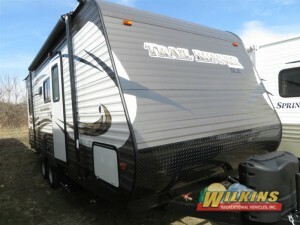 Whether you’re hitting the road for a quick weekend trip or want to head to your favorite state park, you’re sure to love everything this quality unit has to offer. This 21′ long travel trailer sleeps four people and is incredibly compact and fuel efficient. It promises room to relax, yet manages to save you tons of money on fuel and transportation costs. Easily maneuver between tight spots and camp in places other larger units might not fit. Don’t let it’s compact size trick you. 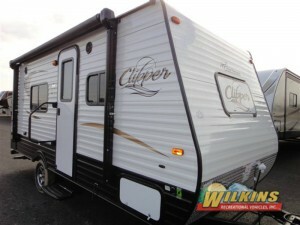 It boasts a queen sized bed in the rear, along with a full bathroom! And, a home cooked meal is just steps away in your own private kitchen that comes with a two burner range and counter space for meal prep. If you’re interested in learning more about these units, get in touch with us or stop by to see our huge selection of RVs under 15k. 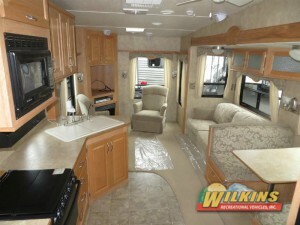 You’re sure to find something that will fit your needs at Wilkins RV.